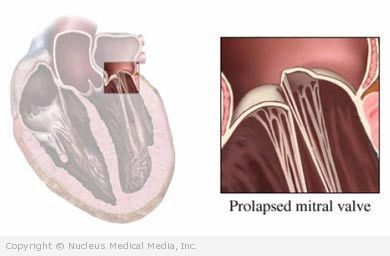 Mitral valve prolapse (MVP) is a common, usually benign heart disorder. The mitral valve controls blood flow between the upper (atrium) and lower (ventricle) chambers on the left side of the heart. Normally, blood should only flow in one direction, from the upper chamber into the lower chamber. In MVP, the valve flaps don’t work properly; part of the valve balloons into the atrium, which may be associated with blood flowing in the wrong direction, or leaking back into the atrium. Mitral valve prolapse can be heard through a stethoscope. A small blood leakage will sound like a murmur. When the mitral valve balloons backward, it may produce a clicking sound. Both murmurs and clicks are telltale signs of MVP. An echocardiogram can confirm the diagnosis. You may also be asked to wear a Holter monitor for a day or two to record the electrical activity of your heart continuously (EKG). In most cases, no treatment is necessary. Although no longer routinely recommended, you may need to take antibiotics prior to some dental and medical procedures. This is to prevent infections. Ask your doctor if you will need to take antibiotics. If symptoms include chest pain, anxiety, or panic attacks, a beta-blocker medication can be prescribed. Ask your doctor whether you may continue to participate in your usual athletic activities. There are no guidelines for preventing MVP of unknown or genetic origin. Avoid medications (such as decongestants) that speed up your heart rate. Exercise regularly, following your doctor’s recommendations.